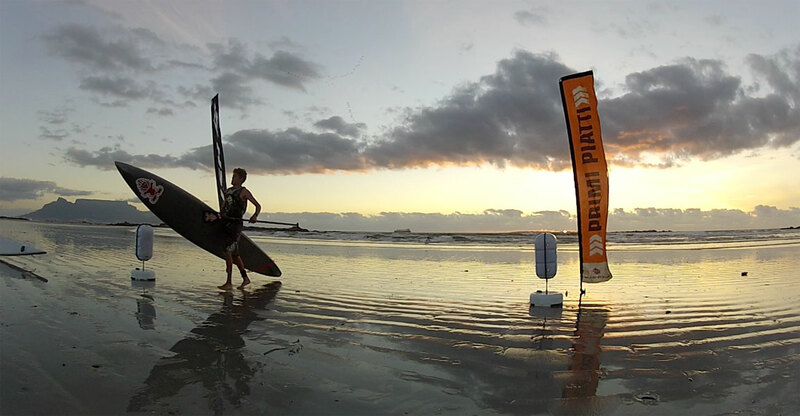 5-10knots of Southerly wind, with a touch of SW at the finish, made for marginal downwind conditions during race #2 of the 2013/14 PRIMI Naish Downwind Dash Series. There were some bumps and there were also 35 takers for the challenge – including a welcome comeback for Chris Bertish. Chris’s return was much awaited as he is a multiple SA downwind champion and has spent the past months getting to grips with the SIC bullet 17’ which has had so much success in Hawaii. The talk of the night was whether Chris on the Bullet was enough to unseat the seemingly unbeatable Dylan Frick on his modified 14’ Sprint. The light conditions seem to suit Dylan and he set off like a rocket – Chris dug deep in set off in pursuit. Third wheel was held by 16yo Ethan Koopmans who had just stepped off the plane from his victory in Las Vegas at the Naish N1SCO World Championship. Ethan had swapped out the 12’6 inflatable ONE for a 23 LE and kept up with Chris the entire way but had to succumb in the end with a 13sec deficit. Dylan however, had once again shown who’s boss coming in 1min 39secs ahead of Chris to take first round of the 14 vs Unl battle. Will be really interesting to see if the tables will be turned once we get bigger conditions! Joshua Roberstson (16yo and 2nd last week) came in a fine fourth while high-wind specialist Greg Bertish surprised only himself to take 5th. Our two First ladies, Mishka Steyn and Brigette van Aswegen once again had a really close race with only 38secs splitting the two leading leadies – this time it was Brigette who prevailed with Clellind Fivaz taking a distant 3rd. Our Masters Ladies was taken by Monika Wohlgemuth while Maleen Hoekstra celebrated her first downwinder with dry hair and a 2nd place. In the Masters division Peter Petersen managed to turn the tables on Pietro Muscas while Oscar Wollheim took a fine 3rd. The light winds also saw 6 first time downwinders give it bash and much was learnt and we look forward to seeing you guys back next week. There were lots of little bumps on offer and you learn everytime, even if it was soft in comparison to our normal downwind days in Cape Town. Lots of wind predicted for Cape Town the coming days and Sunday sees the Xpression on the Beach Millers run!